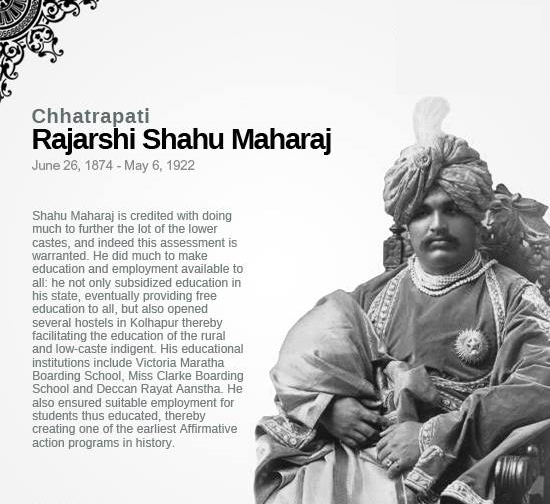 Check also – 26 June 1874: Birth anniversary of Rajarshi Shahu Chatrapati Maharaj. Shahu Maharaj was a successor of Jotiba Phule; he was a product of movement led by Phule called Satya Sodhak Samaj movement. Shahu Maharaj was completely under the spell of Jotiba Phule. In the year 1882, Phule made a demand of free and compulsory education for everyone along with proportionate representation in government jobs to Hunter commission and as a successor of Phule, Shahu Maharaj implemented 50% reservations in his state in the year 1902 where some of the scholars refer this implementation as the first official instance (Government Order) providing for reservation for depressed classes in India. Dr. Ambedkar too got financial assistance for his higher education and his fort nightly paper “Mook Nayak”. Later, on March 21, 1920, Dr. Ambedkar presided over a conference of the untouchables at Mangaon in the Kolhapur state, it was attended by Shahu Maharaj and there he declared “you (Bahujan Samaj) have found your savior in Ambedkar. I am confident that he will break your shackles. Not only that, a time will come when, so whispers my conscience, Ambedkar will shine as a front rank leader of all India fame & appeal.” Krishna Raja Wadiyar IV, who got influenced by the Shahu Maharaj’s policies, implemented seventy per cent reservation for all the deprived groups in Mysore princely state. Later, Dadasaheb Kanshiram too applauded the contributions done by Shahu Maharaj and he rejuvenated the legacy of Shahu Maharaj. Hence, it’s the right time for us to elevate the torch of knowledge in involving and investing our abilities and commitment through the slogan and practice of pay back to our Bahujan Samaj in order to annihilate the rapacious brahminical conspiracies which de- moralized and de- humanized the Bahujan Samaj. Shri Chhatrapati Shahu Maharaj (also known as Rajashri Shahu) (26 June 1874-6 May 1922) was the first Maharaja of the Indian princely state of Kolhapur between 1884 and 1922. First king in India who implemented Reservation Policy ( Provided 50% Reservation in his state, on 26 July 1902) Revolutionary Legal Reforms. Appealed for caste-free India and abolition of untouchability. Pioneer of Student Hostel Movement for Bahujan Samaj. De-recognized Brahmanical supremacy and Religious bureaucracy of Brahmins. Greatest supporter and sympathizer of Dr. Ambedkar movement. The Pillar of Social Democracy. The Maharaj came in cotact with Dr B.R. Ambedkar when they were introduced by Dattoba Pawar and Dittoba Dalvi (artist) and their association lost till the sudden end of shahu Ji Maharaj in 1922. Sahu Ji was greatly impressed by his revolutionary ideas. He met Dr B.R. Ambedkar a number of times during 1917-1921. When Dr Ambedkar expressed his desire to start a fortnightly newspaper to bring about an awakening among Depressed Class Sahu Ji Maharaj denoted Rs2,500.00 for this noble cause. Dr Ambedkar started “ Mooknayak” (Leader of the Dumb) on 31st January ,1920. Also when Dr Ambedkar faced financial problems in completion of his for studies in September 1921. Sahu Ji sent Rs750.00 with assurance to Dr Ambedkar that he can write for any such help to him any time. Again Sahu Ji Maharaj sent a cheque worth Rs1500.00 to Dr Ambedkar at his London address on 5th October 1921. When Mooknayak landed in financial distressed Shahu Ji Maharaj pulled it out by donating Rs750.00 in January 1921and Rs1000.00 on 21st Febuary,1921. The first conference of untouchables was organized under leadership of Shahu Ji Maharaj (21-22 March) 1920 at Mangaon Kohlapur , Dr Ambedkar was Chairman. The Maharaja told the gathering that they had found a leader in Dr Ambedkar who will work for their amelioration. Shahu’s other initiatives included restricting Child marriage in his state and the encouragement of intercaste marriage and widow remarriage. He long patronized the Satya Shodhak Samaj. Under the influence of these social-reform movements, Shahu arranged for several non-brahmin youths to be trained to function as priests, in defiance of timeless convention which reserved the priesthood for those of the brahmin caste. However, he faced opposition from many including Bal Gangadhar Tilak. Chhatrapati Shahu was very fond of wrestling and encouraged it in his kingdom. Many wrestlers from all over India came to Kolhapur as wrestling enjoyed royal patronage in Kolhapur. 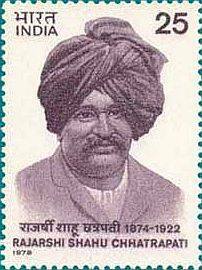 The Indian postal department has issued a stamp dedicated to Shahu. On the first-issue citation, the government of India hails Shahu as “A social revolutionary, a true democrat, a visionary, a patron of the theatre, music and sports. Very nice collection of gems from Dr. Babasaheb. I have been throuh details provided about Rajarshi Shahu Maharaj- seems the work needs to be explored more. As him self proclaimed to be member of Arya Samaj, not just that Shahu Maharaj had handed over his school to Arya Samaj to run. It would be great help if his complete biography can be made available. i need all the books the great dalits. let me have price list.